The Coalition aims to provide the best available tools and resources for improving honey bee health. We coordinate across sectors to develop practical and effective materials for a variety of audiences. Tools and resources are available free of charge, though we ask that you please reference the Coalition if distributing. Every honey bee colony in the United States and Canada either has Varroa mites today or will have them within several months. 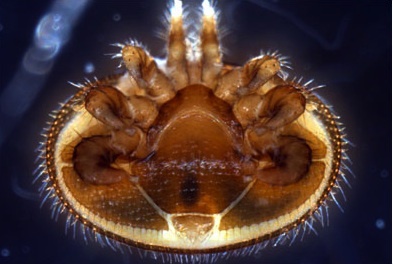 Varroa mites infestation represents one of the greatest threats to honey bee health, honey production, and pollination services. Click here to learn about Varroa mite treatment. The Bee Integrated Demonstration Project brings together beekeepers and producers to show how a suite of best practices can be implemented together in agricultural landscapes to support honey bee health. The multi-year project includes establishing pollinator forage, monitoring and treating Varroa mites, following pollinator protection plans, and utilizing best practices for crop pesticides. Canola is an ideal food source for honey bees, and studies show that honey bees can, in some circumstances, benefit canola yields. Adopting bee-friendly canola farming practices benefits both canola growers and beekeepers. The U.S. Canola Association worked with a broad array of Honey Bee Health Coalition members, stakeholders, and growers to develop best management practices to protect honey bees and other pollinators in and around canola fields. Field corn is grown on more acres than any other crop in the U.S. and the practices corn farmers use can affect honey bee health. The National Corn Growers Association worked with a broad array of Honey Bee Health Coalition members, stakeholders, and growers to develop best management practices to help protect honey bees and other pollinators in and around corn fields. 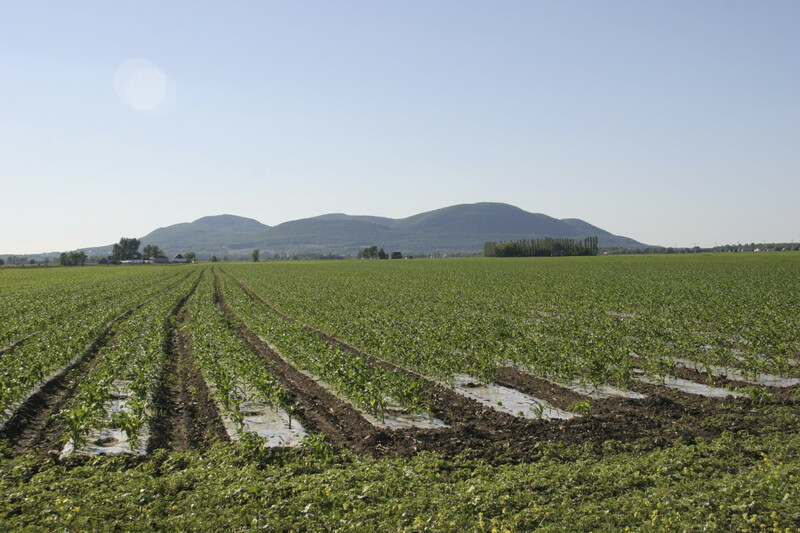 Soybeans are one of the most widely farmed and produced crops throughout North America and the world. The practices soybean farmer utilize can affect honey bee health. Given this, the Honey Bee Health Coalition has worked with a broad array of its members and stakeholders to develop best management practices to help protect honey bees and other pollinators in and around soybean fields. The Coalition developed Best Management Practices for Bee Health: A Guide for Beekeepers. This guide is designed to make it easy for beekeepers to find practical information that they can use. Click here to access the BMP Guide. There are a wide variety of informational resources and scholarly articles available regarding honey bee health. The Honey Bee Health Coalition gathered these select resources together — all of which are well-researched, vetted by the apicultural field, and widely accepted — as a service to beekeepers and others interested in bee health. Click here to learn more. This continuing education module was designed for Crop Consultants, Advisors and Applicators to learn how they can protect bees from incidental exposure. Click here to learn more and access the module. We asked beekeepers, growers, entomologists, and crop advisors to swap jobs and look for ways they could work better together. Their experience was captured on film, so you can watch and see what they’re doing differently. Most states efforts to date have focused on developing MP3s as effective tools for increasing communication among stakeholders and mitigating acute exposures of bees to pesticides. Proactive communication between growers, applicators and beekeepers is essential to protect honey bees from unintended pesticide exposure. Beekeeper and landowner cooperation based on mutual interests is important to mitigate risks of pesticide exposure to pollinators. Click here to learn about the Grower’s and Beekeeper’s roles. The Coalition is encouraging the development of innovative ideas to improve honey bee nutrition through the 2017 Bee Nutrition Challenge: An Innovation Award. Finalists will have the opportunity to network with hundreds of bee industry experts and join a passionate community working on honey bee health. Competition judges will award a total of $40,000 of prize money to up to four amazing project ideas. Learn how to enter at honeybeehealthcoalition.org/nutrition-challenge. Many on-farm sustainability projects already exist as part of grower and supply chain partner efforts. The Coalition seeks to connect pollinator health into these broader sustainability initiatives. Please visit our Supply Chain Sustainability page to learn more. 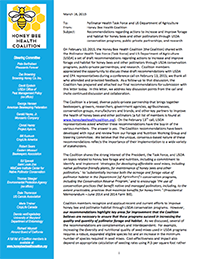 The Coalition’s Steering Committee has provided recommendations to the National Pollinator Health Task Force to inform the 2015 National Strategy to Promote Pollinator Health and the accompanying Research Action Plan. The HBHC provided direct and in-kind support to CAST to produce a paper summarizing the latest science related to declines in bee health. The paper, released in June 2017, discusses methods used to document colony losses, recommendations for research, and suggestions for beekeepers, land managers, crop producers, homeowners, and policymakers to engage in helping to ultimately restore healthy populations of honey bees and other pollinators. Identify and implement Coalition actions to promote and improve beekeeper incident reporting regarding crop pest management- related bee health incidents. Download the Incident Reporting Guide. Bee forage creates multiple benefits for pollinators, crop production, biodiversity, soil health, water quality, and other agricultural interests. The Focus on Forage Series highlights how the Honey Bee Health Coalition, its members, and other partners are working on-the-ground and leading innovative efforts to create honey bee and pollinator forage. Click here to view the Focus on Forage series. The Coalition regularly submits recommendations to the National Pollinator Health Task Force. Read more about our recommendations to increase and improve forage and habitat for honey bees and other pollinators through USDA conservation programs, public-private partnerships, and research. The Honey Bee Health Coalition has pulled together a directory for beekeepers and others to access federal and state agencies, non-profits and programs. 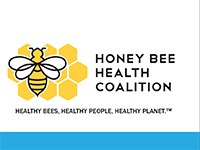 The Coalition’s Bee Healthy Roadmap lays out specific priorities and actions that it will take to reverse these declines and improve the health of honey bees and other pollinators. 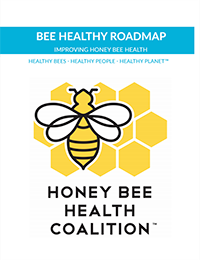 The Bee Healthy Roadmap identifies four priority areas that need immediate and consistent action from partners across the landscape.